Palazzo Guicciardini suites are situated in an historical building of the XV century that was the old house of the Guicciardini family. Our guests have the possibility to spend their time in Florence in those charming rooms full of history, all the frescos are made by Poccetti,fine restored with all the amenities and services of a modern hotel. Palazzo Guicciardini has successfully passed the 100 Quality Controls established by the "Certification Protocol of Historic Houses of Excellence" and is properly certified by the ITALIAN REGISTRY OF THE HISTORIC HOUSES OF EXCELLENCE. CONDITIONS - Vip Experience is reserved to clients of Residenze d’Epoca with VIP Coupon that will BOOK DIRECTLY at Palazzo Guicciardini by 31/12/2019 in a superior room (NO base room). 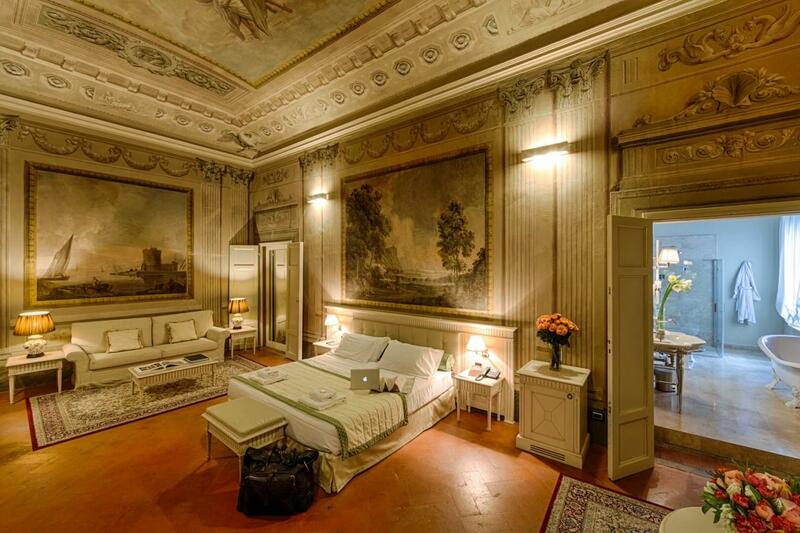 Palazzo Guicciardini can guarantee Vip Experience for up to 2 guests (rooms) during the same period. Vip Experience does NOT include the costs of the stay. CONDIZIONI - The Vip Experience is reserved to Residenze d'Epoca clients in possession of a VIP Coupon, who will directly book a stay in a double superior room (NOT a standard room) at Palazzo Guicciardini within 31/12/2019. Palazzo Guicciardini will guarantee the Vip Experience to maximum two clients (rooms) in the same period. The Vip Experience doesn't include the cost of the stay. We have sent you a confirmation. We'll advice you when a "VIP Coupon - Complimentary" will be available (FREE for you, offered by Palazzo Guicciardini). The phone number of Palazzo Guicciardini is +39 055284711. The fax number is 055288774.